We have never been fond of organised games. Well, if the truth is to be told, with the notable exceptions of board games, Mah Jong and playing cards, we do not participate in games at all. Not for us the hockey field, rugby pitch, or even watching from the sidelines, and never have we attended Wimbledon, Wembley or White City. And, in the summer of 2012 we shall most definitely not be found in the Capital. But for Sheila, our friend and Brighton neighbour, physical activity has, and continues to be, central to her life. She embodies the positive effects of an active lifestyle. Straight of back, sure of foot, slight of build and looking far more youthful than her years, she is an exemplary outcome of a physical education regime which, in its day, led the field. From 1949 - 1952 Sheila studied at Dartford College in Kent, previously the Bergman Osterberg Physical Training College established in 1885 as the first Physical Education College in the United Kingdom, by the redoubtable Swede, Martina Bergman Osterberg. Kingsfield, a handsome country house sitting in 14 acres of Kent countryside, was the base for the College. There Madame Osterberg converted the ballroom into a gymnasium, where the principles of Swedish gymnastics could be taught, and from the surrounding fields courts were created for the playing of Netball, an Osterberg invention following her travels to America and her observation of Basketball games. Madame Osterberg's aim was to provide professional opportunities for women in Physical Education and, some sixty years on, her legacy was still firmly in place when Sheila attended the College. 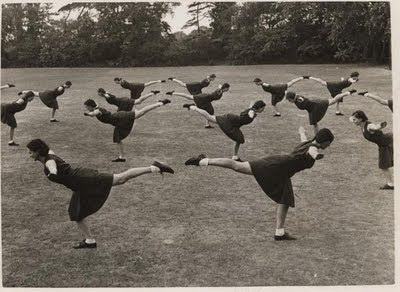 Gymslips [an invention of one of Madame's students] were the uniform of the day, discipline was strict and sporting excellence was the goal. But, above all, the creation of a strong mind in harmony with a healthy body was an overriding tenet. Throughout her own career Sheila put these enlightened ideas to good use, first in schools and then in the training of other teachers at Roehampton. And now, as she looks out to sea from her Brighton apartment, we are sure that she remembers with great fondness her days of hockey on the sandy beaches of Weston-super-Mare. This is a verry intersting "blogspot" But, i'm like you: I don't like games. Wow, I'm not sure I go back as far as your neighbour, I am 61, but I did play, hockey, netball and tennis at my convent school.Our PE teacher played hockey for the England hockey team and we got to see her play a game at Wembley, probably around 1964-5. I remember a few hits on the head from the stick too. I went on to play squash and badminton in my 20's until back injury put a stop to that. If only I was more active I would be nice and slim like I was in the 60's-70's. Thank you for telling Bill at AA about William Yeoward, I have a couple of his books and although I lived in Fulham London for years never saw the shop. Next time in London I will go to the Kings Road and window shop, I cannot afford the prices to buy anything. We are so pleased to have at least one fellow blogger who shares our view!! Gosh, Jackie, you put us both to shame with your expertise on the games field!! How interesting that your games teacher played Hockey for England and what fun it must have been to go and watch her play. We love Bill's blog and are so pleased that you found us via him. As soon as we have written this reply we shall be venturing out to find you. The WY shop is well worth going in to as there are always ideas that can be replicated less expensively!! Your post brings me back to childhood days reading the Chalet School books, where I learned about being a good sport, doing one's best for the team, the joy of splashing across the mud in the bracing cold and the companionable consumption of jam sandwiches and chocolate cake afterwards. My imaginary triumphs on the polo grounds swiftly followed and even now the memories evoke a tired admiration for wonderful people such as Madame Osterberg. I loved my gymslip and my hockey stick bout i would get upset if my stick got scratched and spent ages oiling it back to perfection - can you guess I liked the sidelines too? This has transported me to another time and place. Incredible images. They are all so proud and so earnest. But sadly, I share your abhorrence for physical games. Well, perhaps if I were any good at them I may like them quite happily, but as it is, there are too many other wonderful things in life to pursue which afford a much greater pleasure. Although I do respect people who have the endurance to make it to the top in their field of sport - a certain determination which is admirable. Hi Jane and Lance, what an interesting post about your dear friend, and the photos are wonderful. I am afraid though that they reminded me of my days of boarding school sport. I shudder to think of Lacrosse, Tennis, Hockey...urgh! I am afraid that I was a little naughty and would often not appear at my sports classes, much prefering a cup of coffee in the sixth form study! (Nothing's changed then!). Dear Jane and Lance - Ball games we do not do either. How interesting about gymslips. I love the first photo, I think that it reveals how we were so disciplined as youngsters - no one messing around and everyone doing as they were told. Well, I too was very sporty at school. I was in the netball and rounders teams and played tennis and loved high jump as well as other track and field events. Swimming was my favourite and, I even have medals for it !! I was also Champion girl at my school, which involved competing in various sports. I have often been to Wimbledon and many other tennis tournaments. I wasn't lucky enough to get any Olympic tickets but, that's OK as I love to watch it on the television.....also, my husband and I watch various sports on the television. I am currently staying up half of the night watching the US Open tennis ! The only sport that I wasn't very interested in at school was hockey. I don't know why but it just didn't appeal to me. Sheila obviously enjoyed a wonderful education and a brilliant career. Your achievements in PE sound very similar to our own! We always negotiated to have any other extra lessons in place of PE!!! Unlike you I was sports mad and would have loved this school. I always begged to be sent to boarding school. From my Mallory Towers and Twins at St Claire's it seemed that sport was central to everything. In my own school, both primary and secondary, our teachers were making their point over working conditions so no out of school activity for us, no sports teams and very little music. Luckily I had lots of sports clubs on my door step so I played hockey, netball, athletics, you name it I played it. I always learn something from your blog - thanks!! Ah yes, the Chalet School books and Mallory Towers, how we loved reading them even though the reality of school was very different!! Having never taken up Polo was probably where we went badly wrong as it offers such a network of opportunities for success in every avenue of life. However, we never had ponies either......!!! We are quite certain that you would have looked stunning in a gymslip. And,wielding an oiled hockey stick, we are sure that you would have been a formidable opponent on the games field!!!! Yes, we think that you have hit the nail on the head here, so to speak. Because one has little if any success, so one loses interest, so one does not practice, so one has little success. A vicious circle. And yes, one can only admire those who persevere and have the self discipline to get to the top of their game! Gosh, Linda, how ever did you manage coffee drinking instead of games playing!! We can only remember being dragooned onto the field when being thought to be spending too much time in the changing rooms!! Secretly, we were pleased to leave behind the chilly English weather and have enjoyed some wonderfully hot sunny days here in Budapest. However, the cooler breeze and golden evening glow are definitely heralding autumn here in the not too distant future! We are so pleased that you like the photograph. We love it. But yes, the strict uniform, everyone working in unison and the discipline of it all is indeed striking in comparison with today's much freer approach. We think that perhaps we might have enjoyed it all rather better if we were taught now. I take my example from my Mother and Mother-in law who lived well into their eighties and never went further than the shops at the bottom of the road. Both were buxom ladies, never dieted and were reasonably healthy to the end. I squirm when I see these people jogging along, sweating buckets in the name of fitness. I blame the media and Doctors for their bad advice, and people being what they are they follow like sheep. This is all very interesting! I was never any good at games at school... hockey, netball, swimming and tennis, forced to do them all and hated them! Strangely, I find myself more interested in keeping physically active as I'm hitting my late 30s, possibly the fear of seizing up keeps me going :-) As you will know from my blog, I'm attempting to learn Aikido, subject myself to boxercise once a week and have always been a keen walker. Jackie, we are seriously impressed!! Champion girl at school..... our minds are collectively boggling at such an accolade, and such prowess in so many different sports certainly puts us both to shame. Clearly you have enjoyed and continue to enjoy sport in a variety of forms which is absolutely wonderful. Perhaps you were fortunate to have enlightened teachers such as Sheila? We know that this would have made a big difference for us. Marie, it is so sad that you did not have the sporting opportunities which you would have liked, but how fortunate that you were at least able to join clubs in which to pursue your sports. It does make one think about how different experiences in life shape one as a person. Equality of opportunity we have always felt to be an extremely precious commodity. games of any kind are an abhorrence to me and Beloved. Yes, I would certainly use that word. Both of us were useless during PE and athletics lessons and as for team sport, absolutely no thank you. Even today I prefer to go for a solitary walk rather than join any Ramblers' Association. Any kind of mass event makes us run for the hills. Similar movements as the one you described happened in Germany before and after the last war; physical 'jerks' were held to be the solution to all ills of body and mind and look where that got them. As in all things, there is surely a balance to be found that is the sensible option. Individual needs are so very different but, we feel, it is important to be in tune with your own body and do what feels right for you rather than following the crowd or the latest fashion. How interesting that you now find yourself drawn to sport. It is so true that as the years go by one does make all kinds of lifestyle changes and that is all to the good we think. The Martial Arts are all a closed book to us, we are afraid to say,but we do find them a fascinating topic. Yes, group activities rather leave us cold too. Perhaps that is really the source of the problem and, of course, never being picked for any teams [understandably as we were useless]has made us prefer individual activities, although in our case, the individual is usually the two of us!!! We love walking and find that one sees so much on foot to interest and intrigue. Unfortunately in Budapest walking everywhere whilst looking up to see the wonderful architecture tends to lead to a pain in the neck!! As they say (whoever they are) "use it or lose it". I definitely misplaced mine several years ago and now don't have the energy or muscle capability to look for it! Kalimera Lance and Jane. (Goodmorning)Well i guess Im the different one here LOL.I do walk for 2 miles and some jogging.I love watching most sports...Soccer,football is big here where Iam.I dont like basketball though. Dear Jane and Lance, another interesting post. It was very absorbing to read about your friend and I love the old photographs you have included, they are just marvellous. I must admit that I'm exactly like you and have never been fond of games myself but have been surrounded by incredibly wonderful athletes all my life. My grandfather was a professional footballer (a talented striker who used to wear the no 10 jersey and score goals with his "magic" head) in Italy in the early 40's and met my grandma while playing for the Castellana Grotte fc which back then was a very successful club. My mum tells me that he was wanted by the Lazio fc but declined - back in those days professional footballers were not paid an absurd amount of money like they are today and so he had to give up his much loved football and find a real job - I often say that unfortunately for my grandfather, he was born in the wrong century. He worked at a bus depot instead all his life and supported his family until the day he died. Football was always a very important part of his life and continued to support the game as a coach in his later years. He was one of my favourite people in the whole world. Later on I married into "sport royalty" on the other side on the world...when my husband decided to quit his sport career for a "real" career people thought he was mad...but he did, he enrolled at uni and successfully studied landscape architecture. Twenty years later he's the force behind our company caldesign. Once an athlete though always an athlete I say...you can never take the athlete out of the man (or woman). Do you agree? Like you, I have an aversion to field sports - although 'complete incompetence' is probably a more accurate desciption! For my 'prowess', anyway. Bring back the golden age of parlour games, I say!! The schools you have in England keep amazing me. They are so different then the schools we have/had here in Holland. This school your friend Sheila attended sounds special too. I do like playing a game of tennis and working out at the fitness club once a week, but I don't think a school like this would have been suitable for me. If only for the gymnastics!! hi Jane and Lance! those old sports pics are marvelous! Ugh, you are most definitely NOT alone! My idea of Hell would be an eternal school Sports Day. I can't imagine how they manage to make exercise so unappealing in school? So uninspiring? As an adult I have discovered the benefits of aerobics and yoga, but I wouldn't be caught dead on a netball pitch! I played all the usual games at school, rugby, squash etc, and I was captain of swimming. After I left, exercise rather took a backseat, but since I stopped working, at 40, I have become fanatical about exercising, (not to the point of boring people about it, I hasten to add), but it has just become an integral part of my life - ideally 5 times a week, but certainly never less than three - "working out" (what? ), or swimming 1500 metres, and there is really no excuse not to, when the facilities are on the premises. Well, not the pool at the moment as it's being renovated, but we use a friend's round the corner, where indeed we were this morning. Your friend Sheila had the right idea. This regimen allows me to lead a dissolute lifestyle, (from time to time)! Swimming outdoors in the sunshine and tennis are really the only two forms of sport that I can enjoy without gritting my teeth! Winter term hockey in scratchy hockey shorts/skirts and horrible shinpads in the freezing cold, ughh!! But I do like the ideals of team work and sportsmanship and I can see the ways it really benefits my super-sporty sons. Wonderful pictures of the athletic ladies in this post! Your comment really made us laugh! But, Dianne, all that messing about on boats....that looks like exercise to us!! Ahhhh! Our faith in the all seeing all knowing capacities of games teachers is restored! We were so amazed at your party preparations and can think of no-one who has gone to so much trouble to give family and friends such a good time as you clearly did, Linda. We are so pleased that you had a good time too and, well, you know us, we always leave the catering to someone else.....otherwise everyone would go hungry!!! We fall into two distinct camps, don't we - either we loved games, PE and the like, or we really didn't! I'm in the latter and devised any number of wheezes to avoid the subject, including taking up playing the clarinet (the lesson was the same time as PE)and finding shortcuts in the cross-country, remembering to find a muddy puddle to get my pristine socks and shoes dirty! I somehow didn't see you as hockey-stick wielding, rugby-ball slinging types or team playing types...you two are definitely 'individual'! 2 mile walks and jogging sounds like a serious amount of physical exercise to us. You have our deepest admiration and it certainly puts our gentle stroll to our local coffee shop into perspective!!! Thank you so much for taking the time and trouble to leave such a wonderfully detailed comment. We have loved reading about your grandfather and one can only imagine what would have happened if, as you say, he had been born into a different decade. It is such a pity when someone has a wonderful skill but cannot find the opportunity to earn a living from it. What a most interesting sporting family you have become part of and how brave of your husband to venture into a completely different 'field' with landscape design. We agree, however, that surely one cannot ever remove the athletic buzz completely. Certainly, our friend Sheila still loves to watch all manner of sporting action! I quickly learnt the art of ducking or evading if a ball was kicked, thrown or hit towards me. Should someone pass a bat or racquet to me, I made a display of puzzlement over which end to use. Now I walk, occasionally swim and climb flights of stairs. This is insufficient, apparently, however my siblings get plenty of exercise and are quite fit. Parlour games....now you are talking!! We love them but cannot remember the last time one was invited to a party where they played a part. Definitely time for a revival!! Hello, Hattatts. Our news reports often mention some poor athlete who died after a race, a game, a practice... but it is rare indeed to see a report of someone who died while perusing a menu. We have governed our lives accordingly. The Training College was, and indeed is still, regarded as being very forward looking in its day. Professional careers for women were not as commonplace as they are today and so this opened up entirely new avenues for women to pursue and to make good livings from. Madame Osterberg was certainly a female emancipator in her own times. We are so pleased that you have enjoyed looking at the photographs. They come from the Martina Bergman Osterberg Archive which our friend Sheila has helped to establish and develop. It's not the winning that counts it's the communal showers afterwards! The first time I visted a gym I did the weights on the bench press, the treadmill, the rowing machine you name, I went on it, I came out of that gym 2 hrs later all a glow. However the next day I was in total agony with chest pains, I thought I was having a heart attack, at my tender age! I rang NHS direct, they wanted to know my date of birth. I might have been desperately ill but there wasn't any need for that sort of talk, so I hung up on them in disgust and made an appointment to see my doctor who told me I had pulled a muscle, and they say excerise is good for us! We have gruesome memories of a particular School Sports Day when we were both teachers [not of PE] many moons ago, but that, as they say, is another story!! You are so right that the best PE teachers really can inspire but that is, perhaps, the same for all teaching subjects. Yes, we have to say that the idea of a swimming pool right where you live definitely has an appeal, if only to dangle toes in the water. But your gym sessions sound like our idea of purgatory!! And, 'working out'....what a curious phrase that is. Like you, we wonder to what it could refer......the meaning of life, perhaps?!!! I like all sorts of games and sports, but prefer spectating to taking part. However, perhaps if my skill level was higher the response would be different! Ohh, shinpads .....we only remember them as never fitting correctly and never preventing the multitude of bruises inflicted by lacrosse sticks, hockey sticks,rugby boots or soccer studs. The sports field always resembled a battleground to us and we took on the roles of walking wounded!! We agree that there is much to commend the promotion of a team spirit and good sportsmanship and it sounds as if your sons have and will continue to gain much from their sporting activities. I have to dig out a quote I have buried away about English school girls and hockey sticks, which sum this post up perfectly. Even in Australia we had similair schools established for young women, and they were always established by some matronly spinster. Helen is going straight out into the yard and trying some of the things pictured in your excellent narrative of Shelia's dedication to fitness. Tell me, do you think it detracts to do calisthenics while holding a martini glass? Learning the Clarinet to avoid games lessons does sound to be veering towards the extreme although the extra Mathematics lessons we opted for also sounds rather alarming now we come to write about it!! You are right that people do seem to fall into two distinct camps where games are concerned, ambivalence is rare!! We can only wonder just how many stairs you climb as a High Riser!! You certainly seem to have tried out a number of evasion tactics in sport avoidance but although similar activities always meant that we were never selected for any teams, there would always be some individual exercise horror that we were required to do!! This comment really made us smile! However, it did make us recall the death of UK celebrity chef Keith Floyd who died after eating a meal of Oysters, Partridge and Champagne! Still, if it is a choice between that and the hockey field.......!!!! Oh, no, not the communal showers!!!!! We do so hope that you have learned your lesson from your hideous experience in the gym. However, perhaps if you had done just a little light jogging and not gone overboard with every machine in sight, all would have been well. Moderation in all things they say......!!!! Yes, we agree, if perhaps one was skilled at a sport then the enjoyment would be so much greater. However, no gain without pain!!!! How interesting that you can recall Australian counterparts to what we think of as peculiarly English schools. And yes, somehow there is always a Madame Osterberg equivalent to found them. We should love to read your quotation once you have unearthed it! If anyone is capable of performing calisthenics whilst holding a martini glass replete with cocktail, then it must be you!! This could then well be the form of exercise that we have been looking for all our lives!!! My dear Jane and Lance, I'm not at all a game person as you both know(I did play a bit of croquet when I was at Durham but would one consider croquet as a sport? )I hated my PE lessons at school. It was like a torture to me. But the school of Martina Osterberg you mentioned sounds very interesting. I think that sport can teach something valuable in one's life if one can bear it. It's often about the stamina and team effort which are good qualities to have in our life. Your neighbour Sheila sounds most interesting. I once met the most energetic lady in her 80s and wondered how she could have the energy (I was exhausted from following her around and I was only 27 at the time). She had a nickname given by her family; "Granny on her bike". No one can stop her. I don't think she knows what the word "tired" means. What a fascinating bit of history. A sports academy for women must have been quite an anomaly in those days. I always hated gym glass and team sports, but loved solitary activities like running. In my 20's-30's, I took up Morris Dancing, which is a team sport of sorts, I guess. Anyhow, that was Big Fun. What an invigorating post! 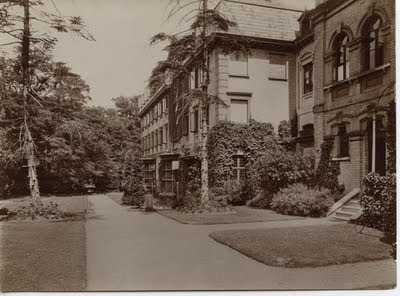 I adore the photograph of Kingsfield Kent, such rich atmosphere captured by a single image. Are the girls playing netball sporting a gymslip, I wonder? We are sure that we should be kindred spirits as far as sport is concerned and a game of Croquet sounds fine to us. Indeed, we have a full Croquet set here in Budapest but, alas, no lawn on which to play it!! We agree wholeheartedly that there are so many valuable lessons to be learned from physical activity but, as you say, one has to be able to bear it in order to reap the advantages. For us, it will never compare with a good book. Our friend Sheila sounds very much like your acquaintance and we are ashamed at our level of fitness in comparison with hers!! Yes, Madame Osterberg's Training College was a pioneering institution and did serve to launch many hundreds of women into professional sporting careers. Indeed, the first similar college for men was founded many decades later. Morris Dancing.....how intriguing....and yes, although we have never thought about it before, we think that it must be a team sport. We cannot recall ever seeing a woman taking part. You must have been a trailblazer!!! Fencing sounds a most interesting sport to us, but perhaps we have watched too many Errol Flynn films!! Yes, the girls playing Netball are wearing gymslips. Such attire caused quite an outrage at the time as it was regarded as somewhat indecent. However, it did mean that physical activity was possible rather than being restrained by the Victorian dress of the day. Today, the Bergman Osterberg archive is housed at Kingsfield House where North West Kent College, under the overall auspices of University of Greenwich continues to run Higher Education courses. This reminds me when in 1960s I was going to a co-ed Convent school. Discipline was very important, we wore uniform and every day participated in physical activities from baseball, basketball to simple running. Until and unless you have a note from the doctor, you had to do physical activity. Most fun was when boys and girls teams competed against each other. Though now, I do not play any game in particular, but do walk every day to burn some calories and get some fresh air. Being uncoordinated settled the sporting option for me. That said, I did enjoy fencing and football, and I didn't mind being bad at both. Hello Jane & Lance! I love how your blog posts elicit the most interesting comments from people. This one has us all thinking about our athletic prowess, or lack thereof--I love it! It seems that many of your commenters are not athletic-types. The old (and fascinatingly fabulous) photos remind me of the photos I have of my grandfather and father, who were big college (American) football players. My father was even recruited to play professional football, but opted for medical school instead (methinks this was a wise decision ;) ). That said, they encouraged my sisters and me to pursue all manner of sports which we did with enthusiasm. My boys have followed suit, but (thankfully) not football, but fencing and crew! A marvelous post, as usual, and very nice tribute to your friend! I hope my back is as straight when I am her age!! Your boarding school regime does sound to have been strict and very much reflects our own school experiences. Indeed, one almost had to be on one's deathbed to be let off!! We too like walking, even in the city, since there is always something or someone of interest to catch the eye. Perhaps you found, as we did, that those students of limited [or indeed no] sporting prowess formed a supportive, alternative club of their own. Much more fun, in our view, than the organised teams!! Well, Sheila is certainly in very good shape so as far as we can see there is much to commend the training. As you are clearly an active person, we are fairly sure that you would have enjoyed life there too. Although we have no interest in the Olympic Games, we do so hope that they will pass off without any negative incidents. The participants train for so long to reach this standard of excellence that they deserve to be able to compete without worry. And, for many millions across the world, this is an occasion not to be missed. How wonderful that Sheila had the opportunity to study and focus on the subject close to her heart in such attractive surroundings. To know exactly what one wants to do at that stage in life must be a blessing, and lead to a satisfying and fulfilling life to look back on. I loved most sport at school until the teenage years, when I would try to get out of games (and the communal showers which followed in those days)rather than suffer the misery of cold muddy afternoons on the hockey pitch trying to avoid a wack on the shins! Thanks for your comment and congratulations to Bella - she is a happy relaxed girl these last days of holiday! We are always delighted and entertained by the wonderful comments which we receive. There are so many true individuals in the Blogosphere all with fascinating stories to tell. Your family past and present clearly have some impressive sporting achievements under their belts and we are quite sure, Elizabeth, that you and Sheila both could run rings round the pair of us!! I throughly enjoyed learning about this. I am not a sports fan but I am a keen exercise fan; the only competition I welcome is with myself and seeing how much I can accomplish to maintain my fitness. So, like you I walk, but I also do yoga and workout with a trainer a couple of days a week. Here to, as late as the mid 60s, the creation of a strong mind in harmony with a healthy body was an overriding tenet. Children were encouraged to stay outside in all weathers, to run semi naked into the ocean, to get plenty of fresh air and exercise. Sheila speaks with such fondness and enthusiasm of her days at the College and clearly found it all to be both life enhancing and satisfying. It did, as you say, give her and countless hundreds of others who studied there an opportunity for real career progression that they might not have found otherwise. Sheila now delights in the development of the archive materials which are held at Kingsfield House and even has a room there named after herself!! Bella has clearly worked very hard to achieve such a bounty of GCSEs and at such impressive grades.You must be very proud of her. She fully deserves to enjoy a few relaxing days now before starting on her Sixth Form courses. We wish her continued success! You obviously take your personal fitness very seriously and how we wish that we had the self discipline to follow suit. Even the benefits of our walking are offset by the coffee house which is usually our destination!! Gosh, the semi-naked ocean swimming sounds very progressive!! Still, it was the swinging sixties!! There is no faster food than an apple.If only it had the same appeal as a hamburger.....!! Hi! I never liked hockey because of its violence but we watch it a lot these days since our boys made the playoffs and lost the Stanley cup to Boston. In our time hockey for girls was never heard of. It is true that women have made tremendous inroads in all manner of different sports, many of which previously were the sole domain of men. Progress indeed!! For most of my life, I have feared anything that would involve me in a sport. Being totally uncoordinated, I would freeze when someone mentioned "Let's have a game" (of something involving a disc or ball). When I was younger, everybody was into tennis. I tried, I really tried, but taking those lessons was so humiliating and made me want to run out of the gym screaming. I would have rather had all my teeth pulled out. My children did not inherit my disability and were terrific at the activities they participated. I must have married into a sporting gene. This brings back to mind gymnastics in junior high school. I never was much of one for sports but being able to achieve a sense of perfection from certain body positions always gave me a feeling of satisfaction. I still remember all the practice involved and the camaraderie of working with partners. Today, a board game is a good thing. We can totally sympathise with you over the ball games. this all sounds too, too familiar to our own experiences. However, how wonderful that your children have enjoyed a different experience from yours in sport. It is so life enhancing when one can achieve success. How marvellous that you were good at gymnastics, it is such a beautiful sport but was quite beyond either of us! We love playing board games and have an extensive collection which we are thrilled to delve into when any of our visitors express an interest in playing. Monopoly is a favourite! Oh I say, my dears, all this sporting malarkey here means I've got to have a little lay down already. I like a bit of cycling, but unless the spread around my middle was vast, I probably wouldn't be doing that either. I also remember the fondness of dancing on and off stage at the WinterGardens in Weston Super Mud. Whenever I come here, I always end up leaving with a big smile on my face. So thanks. Yes jane and lance thats the scientific name for the plant on my blog,but also it can be called September Beauty.Isnt it gorgeous? We do feel that you are very much underplaying your cycling prowess here. Indeed, from what you write, we should faint at the thought of the cycle rides that you make never mind actually doing them! We agree that there do always seem to be vast numbers of healthy looking individuals jogging along Brighton seafront in whatever season at whatever time of day or night. No underground clubs for us, but cafés definitely!! Well, as you can imagine, we are very pleased to learn that playing Mah Jong keeps the old mind active. Some compensation at least for the lack of team games!! We count ourselves extremely fortunate to consider Sheila a friend as well as our neighbour. She certainly epitomises the good sense in leading a healthy lifestyle. Yes, it is indeed a wonderful plant. Beautiful and elegant, an excellent choice! I have always been a most disappointing team player. Too much of a daydreamer to concentrate on the score and highly non-competitive. But I did love riding. Well, just the thought of Mah Jong can send ME into a panic attack; so I admire your grit! As for Sheila, she has my respect. I absolutely love the photos! Love when you post these fun and interesting stories about your friends. I can't believe you can find the perfect photos to go with them. Adore the "Taste of Brighton" post. The "Artisan" shop look quite delectable and I would surly be camped out there. Neither of us has ever owned a horse or taken up riding, but we do think that it is not as easy as it might appear. It seems to us that this was the perfect way to lose yourself in thought and yet be able to enjoy exercise outdoors. Well, we should not be ones for watching Cricket [rather similar to watching paint dry in our view!!!] but we would join you in the tent afterwards. Not, however, for beer as that is not to our taste but Cricket teas we have always found to be wonderful!!! In the absence of other players, we have to admit that our Mah Jong skills are becoming rather rusty. We hope to convert our young Hungarian friends into playing as we find it endlessly fascinating. Sheila we regard as a role model in many, many ways but especially her zest for life and her appreciation of the absurd!! 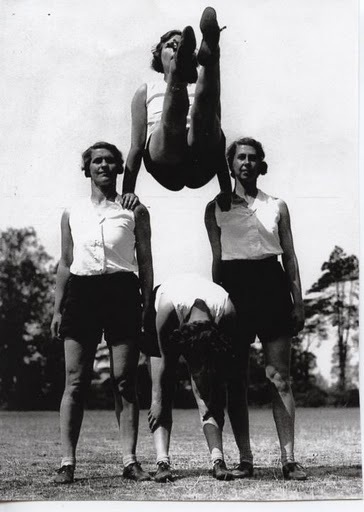 The photographs for this post presented themselves as they came from the wesite archive of Martina Bergman Osterberg which has been set up and developed in recognition of her work in the history of Physical Education. Artisan is a gem. We are rarely out of it when in Brighton. I am absolutely not athletic. To be honest, it's torturous for me to watch some kind of an athletic competition. But I have always admired the people who are athletic, and I even feel jealous of them. As always, I find something new for myself in your posts. Yes, like you, we are somewhat envious of all those athletic looking individuals who from time to time jog across our paths! We work on keeping athletic minds instead!!! I am no sports person either, I am in your club! I loathed gym/sports/Phys Ed in school...the only sport I sometimes play is tennis with hubs, we are very competitive. That being said, if the Olympics are on TV, I am glued to the TV the entire time. Not sure why that is! I used to watch figure skating back 24/7 back in the late 1980s/early 1990s when skating was good and had better technique than skaters today. Thank God for old youtube videos! Give me Torvill & Dean's or The Duchesnays skating routines any day over today's skating! Rant over. We think that we should be afraid to meet you and your husband on the Tennis court, perhaps the club house would be safer!! We have not seen any ice skating for years but can certainly remember Torville and Dean and 'Bolero'. Wonderfully elegant, controlled and obviously the product of an enormous amount of disciplined practice. Sheila sounds like a wonderful lady. But I'm afraid that I'm with you both. Too many days in forced PE at school where I was the last to be picked for the rugby or football team! Indeed I could win gold at such events. First, let me say that I absolutely love that picture of Kingsfield. What an elegant and handsome place. I always liked Kent anyway (think traditional English apples and Knole)but my mental image was more rural and bucolic. The exercising girls were a little scary--those kinds of pictures always remind me of propaganda put out by communist and totalitarian countries. Footage similar to this was often used satirically by the Czech filmmaker Jan Svankmajer. Do we detect that you are throwing down the gauntlet here for a coffee or red wine drinking contest? If so, we readily accept!!!! Sheila is a remarkable woman and could, if truth be told, win hands down on the coffee and wine stakes as well as the athletics track!! Kent is indeed a most interesting and varied county. Wonderful countryside and also some very handsome country houses. Yes, we can see exactly what you mean about the images of the girls and would agree with you about the sinister undertones. We do not know the work of Svankmajer and shall certainly be looking him up. I'm very pleased to 'meet' you after reading your well-considered comments on other blogs. Well, Sheila sounds a formidable character - maybe it's in the name! I know of two 'Sheila's' who live a very energetic lifestyle and do not mope or sit still for a moment. I very much enjoy your descriptions and am glad to have finally started following you both. Oh my, I am horrible, I clicked "jump to comment form" as dinner is cooking and I don't dare peruse the 113 comments. I know that I have asked this before--but is there any manner to receive an email notification of your new posts? How do the rest of your fine followers do it? I know that I check in regularly to see when there is something new but am always behind! As always, I so appreciated this little take on your world and your experience. I detest all games where there is a winner or loser and always have. When we play card games in my family it is a pretext for drinking lots of wine and laughing. Thankyou so much for taking the time and trouble to give us these Svankmajer recommendations. We shall certainly be following them up as we do enjoy watching films and making a new discovery such as this is quite a thrill. No group games here, either, unless it's a very loose form of volleyball. My years in gym were pathetic. My basketball dribbling would not have made me eligible even for the Special Olympics. I did not jump over "horses," I crawled over them. Individual activities are fine, like walking. Board games, too. I always loved a spirited game of Pictionary. Are you familiar? It's sort of Charades with drawing. We are delighted to welcome you as a Follower and do so hope that you will continue to enjoy what we write. How strange that between us we should know so many wonderful Sheilas!! Indeed, we could instantly add another of our friends to the list too. Dearest Heather, we only posted this blogpost this very afternoon so have absolutely no idea how everyone has arrived so rapidly!! Timing, however, is not an issue with us, when it comes to blogposts we are just thrilled to see friendly faces arrive whatever the timre of day or night. You are definitely asking the wrong people when it comes to the technological technicalities of blogging. But, we love you just as you are, so please do not change. We like the thought of card playing and drinkng wine. That sounds just the kind of sport which is right up our street as they say!! Are we too late for dinner?!!! Well, Teresa, your comment has really surprised us as we think of you as an extremely capable outdoorsy type of person with an athletic build and a level offitness to match. We are sure that you are seriously underselling yourself here!! We love Charades [would you not guess that this would be so?] and so Pictionary sounds like a winner to us. Not sure about the drawing though.....!! Interesting post, Jane and Lance. I'm not one for participating in sports or games, never have been. In high school they made us play Volley Ball in the back yard (literally) of the small school building. The ball was always hitting me on the head (non intentionally). That may explain a lot of my life's decisions, by the way. I loved hockey. I played street hockey sometime with the boys. It was always my favorite sport to watch. What an extraoridnary life your friend as led. What a lovely piece and those pictures are just wonderful. I do have to agree with you on sports, I've never once been tempted and the thought of team sports just leaves me cold. Your post reminded me about my own school days and how grateful I was that our family doctor, dear old Donald Gaston provided me with a permanent doctors note for games, giving rise to many a happy hour spent wandering aloofly around the school grounds while the other boys huffed and puffed their way around the fields. A healthy mind in a healthy body was indeed Madame Osterberg's goal, but rather difficult to achieve with constant hits on the head!! Poor you and no wonder you have turned to books with such a vengeance!! Hiking and street Hockey sound extremely energetic to us. We are in awe! We have never heard the term street hockey before and wonder what the difference must be with 'regular' hockey? One thing is for certain, however, whatever it is we should be bound to be useless at it!! A permanent doctor's note...how we should have loved to be able to wangle that. And now you are a doctor too! !Perhaps that early experience had a more profound impact on you than you credited it for at the time. But how wonderful that you, like us, can now spend time strolling between coffee shops rather than cross country running!! I'm not a sporty person either, Jane and Lance, though I did play a reasonable game of netball back in my grammar school days. I was interested to read about its inventor, so thank you for that fascinating little history lesson. Hmm, are you too late for dinner? Well, yes and no as it is midnight but...Remi's guest for the apero is still here! My on earth do I detest that, rambling on, not asking any sort of questions about anyone else whatsoever. Finally, Remi turned to me (it was a hint, though one completely lost on its true subject) and said "well, I am hungry...I guess we should eat something..." and so I scrambled around but my! It has already been a long day! For you both however, I would turn over the hills to make something tasty and you would be welcome to keep talking until the dawn if you like! Just a little thank you for your friendship and good night! What an interesting post as always. I'm not the least bit sporty, but spent the first half of my life thinking I was...seems everyone around me is very sporty and very athletic. My husband played sports through college and I think my son will die if he does not have the opportunity to play a sport in college. These days it's so darn competitive. That first photo resembles what I do every morning and they call it Bar Method. Of course we have a bar in front of us so the balancing act is not quite as challenging. The second photo, involving Netball as you call it...I would be the one hoping the ball Didn't come to me! Oh I hear you! What a wonderful idea and experience thatmust have been! I myself was a long distance runner in the past, but my older shares your view of this 100%! Anything better than running! ^.^ Lovely memoir however, and such a sentimental note! As always you have offered another interesting and entertaining post for our reading enjoyment. And as always it has struck a deep and resonating cord, in myself as well as others as evident in all the wonderful comment you have received and replied to. And now with your approval I would like to cast my two cents worth in on the subject of sport, fitness, and the like. My views on sporty activities were forged early in life. Growing up in a rural area my playground were the woods, fields and creeks around our home. For me exercise was the running, jumping, leaping and climbing. Lessons in balance came from the walking on tree branches at heights that would have more then likely caused my mother to panic has she known what I was about. Poise was learned in the act of balancing oneself on slipper rocks while fording creek beds. There were grapevine to swing from and hills to run up and then roll down, sometimes head of heels. Then like many I went to school and had to endure forced “Physical Education”, which I found boring and bland. To which I was labeled as lazy by the teachers, the same teachers by the way who delighted in my weekly contributions to show and tell by bring potted tree saplings, rock crystals, small amphibians, all of which were gathered from deep within my playground of woods and fields. Hmm, a little mislabeling if you ask me. Marvelous pictures, and what a lovely tribute to your friend.You always have something or someone special to share--and I do so love to read your posts! Perhaps for so many, and we should include ourselves here, Physical Education in schools in the past made little provision for those who neither had an interest in, nor inclination for, sporting activity. 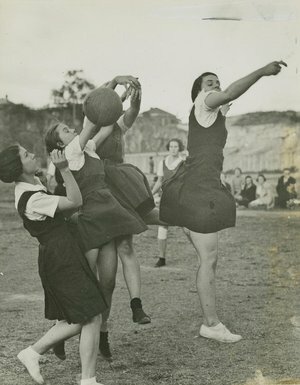 Until we met Sheila we too did not know of the connection between Madame Osterberg and the game of Netball. Oh dear, poor you and poor Remi. How tedious it is to have to spend time with those whose only interest is in themselves and who, in our experience as well, never take a hint and have no idea when to leave. Do they, we often wonder, bore themselves as well as others? One day, who knows, perhaps we shall all meet up and then there really will be tales to be told!! Gymslips! Perhaps these could catch on as the fashion trend of 2012?!! Watch out for them at the London Olympics! I should think I'd not mind living in a time when people were scandalized by 'indecency.' I rather revere modesty, despite having come of age in a time where it all seems a bit trivialized. We spent our entire lives at school hoping that the ball would not come in our direction! And when it did, we had absolutely no idea what to do with it. But we are always filled with admiration for those, like your husband and son, who do excel at sport and who, so very often, are most knowledgeable about so many different games. We really do take off our hats to you for your long distance running achievements - by no means an easy sport and one which, we believe, requires a great deal of determination and self discipline. Sdaly, we remain firmy rooted to the starting line, along with your daughter!! What a marvellous, evocative picture of a carefree childhood you paint in this wonderful, and delightful, response. And how fortunate you were to grow up in what sounds to have been an absolute rural idyll where Nature played such an important role in your physical and mental development in those formative years. But the two edged face of the teachers at your school which, sadly, we believe to be not uncommon. Let us hope that today they are more enlightened but, in many instances, we fear that most likely little has changed. Thank you so much, Gary, for taking the time and trouble to write this comment which we have so much enjoyed reading and which has given a completely different perspective on the whole subject of sport. You are always so very generous, dear Jen, with your comments and we do wish you to know that they are really appreciated. We consider ourselves so fortunate to have Sheila as a friend and neighbour and, when we are away, we know that she will keep a really good eye on our flat for us. Good morning/evening dearest Suze! Yes, we often think that we are really people who belong to another time. Perhaps we have all travelled unknowingly in a time machine and got off at the wrong stop?!!! Hello Dear Jane and Lance! Well, I must say, I so admire your friend and neighbor. I love these photos, and have many times wished I had at least some sort of athletic ability. Alas...I do love dancing, though! Board games and dancing, that's me.. It's funny, just today I was telling a friend how I would ask my mother to write all sorts of notes for me to get out of P.E.! Thanks for the entertaining post, and a wonderful tribute to your friend! i grew up with this. and i agree. and is amazing what this lovely woman did. but the word training just feel so boring you know? one must think, that while doing things, preferably out, then that is enough training. a walk in the woods or weeding in the garden. i like it this way best! As a dancer, we are sure that you are seriously underestimating your athletic ability. Dancing is such a challenging combination of balance, rhythm and stamina and we can well imagine that you dance beautifully. Somehow we never managed to wangle excuse notes out of anyone and so just had to face the music, so to speak. We are certain, however, that if Sheila had been our teacher all would have been well. Sheila never fails to amaze us and we are very much inspired by her. And, you are so right, 'training' does indeed sound boring and off-putting. We shall now, as you do, think of walking and gardening instead of training.......we feel better already!! Yes, we know exactly what you mean about exercise with a purpose. Somehow running round and round a track just to get to the end seems a huge waste of effort to us. And, how lovely for you to be able to walk along the beach as your 'training regime'!! Hello! I like the sport...This post is very interesting...about her life..
With all your travelling, we are not surprised to learn that you like sport. Thank you for your kind comment. What wonderful photographs ! Sadly my meories of hockey are not jolly at all ... brown PE knickers and a bellowing Gym mistress loom large ! As always, I find your posts most interesting reading. And the pictures in this post are wonderful to see. How I wish I had been more like your friend Sheila. I attended an all girls school in the 1960's, and was required to play hockey, netball and tennis. I was dreadful at all three sports, did not make any of the teams, and was always pleading with my mother to write a sick note which would allow me to miss PE. With the exception of horse riding, I have no interest in sports today. I would however like to have the posture and build that comes from being an accomplished sports person! I am sure if I met Sheila today, she would no doubt say "straight back dear". I imagine her to be a wonderful lady, and would sit perfectly straight while listening to her wonderful stories. Oh dear, Annie, your sporting days certainly do not sound to have been jolly at all. As for the bellowing gym mistress, well we should most surely have been scared by her. Thank you so much for visiting us and, as soon as we have finished writing this we shall be visiting you. We hope to welcome you back here again. Sadly Dartford has changed somewhat. It used to be my old stomping ground when I used to go to a club called Flicks. Lets keep this between ourselves. We find it hard to believe that you are in the non-sporting camp, Abby!! With all your horse riding, we had imagined you to be the athletic type since, in our book, looking after horses is extrememly hard and demanding work. Yes, no slouching for Sheila and nor should we as we suffer from bad backs. A sure sign of a missspent youth!! We did enjoy our visit to Northumberland which seems several lifetimes ago now. Such a beautiful, unspoilt county with dramatic countryside and interesting places to visit. We might well take you up on your offer one day!! We can just imagine you at 'Flicks' in a gymslip, Miss Scarlet!! Oh, that kind of 'hockey' eh :) For just one moment, I jolly well thought it might have something to do with that other form of hockey, which in Canada, is the 'law' that you either play it or watch it! Enough of my silliness. This was an inspiring post and Sheila is indeed testimony that keeping active, utilising positive resources, is vital to our well being. Thanks for sharing this marvellous story with accompanying fascinating photos. Hockey in all its forms would be classified by us as a highly dangerous activity!! We have no idea how we should be able to survive in Canada but, dear Gary, you would, we are sure, be able to assist us in finding an alternative form of amusement!! Yes, Sheila for us is a role model although we find it very hard to even begin to follow in her footsteps or indeed keep up!! Now then, my illustrious, extremely popular, although I, on my shy, humble, modest and very unknown site, is not the slightest bit jealous, has a claim to fame. For I have never lost an egg and spoon race. I can teach you, my friends. Ooooh an egg and spoon race, now you are talking Gary!! And what about Tiddlywinks.....provided that you play nicely that is?!!! I have to say I think the gymslips are super cute! If only we had those when I was in school. We just wore baggy T-shirts & floppy shorts (not the last word in fashion to say the least). Funny thing is, now I love watching games (US open at the moment) & playing in them. Funny how something you *hate* becomes something you look forward to & love later in life. Yes, we agree. The gymslips certainly have a stylish retro look in our eyes although for our own part we should give the somewhat heavy duty looking shorts a miss!! And yes, you are right about how we make different lifestyle choices as we age. However, we are certain that if we live to be a 100 we should never be keen to watch or play golf!! Yet another wonderfully interesting post. Sheila's education at the first physical education college just could not get any better. I enjoy running and participate in runs for cuases. The only team sport is painting triptychs with my two art partners Violetta and Mary Rose. Wishing you a terrific week. It doesn't seem my comment "took." But can I repeat it? So much has been said, it's hard to know what to add, but I did thoroughly enjoy the photos! We love the idea of painting triptychs as a team sport which would, for us, always assuming we could paint, which we cannot, be an ideal way of 'joining in' and engaging with the team spirit. As it is, we shall continue to look for Ludo partners! We are so sorry that your comment went missing. It is always so frustrating and seems to happen to us from time to time. However, we really do appreciate your taking the time and trouble to respond. We do agree about the pictures - they are utterly splendid. Dartford college must have been heaven for Sheila and anyone who desired a career in physical education. It looks a wonderful place to study. I am very fond of visiting an arts and crafts house overlooking lake Windermere, Blackwell was an one point a school for girls and I was very impressed to learn that in winter, they used to deliberately flood the car park and use it as a skating rink, that's the kind of school I would have loved! No health and safety police then either. I never particularly enjoyed school sports lessons and these days I like to see some reward for my exertions, like a weed free garden or clean house! Please forgive me, I forgot to say thank you very much for your book recommendation, The Wild Garden by Judith Berrisford. I have tracked one down and am awaiting it's delivery. I am looking forward to reading it very much. Yes, you are right. Sheila speaks of the college with enormous fondness and enthusiasm. Although it was a tough regime, the camaraderie was strong and she has maintained her contact with the college ever since. Gardening and housekeeping are certainly demanding exercise and, we agree, the end results make it worthwhile......until it requires doing again, of course! We do hope that you enjoy the Berrisford book and are so pleased that you have been able to track it down. We have had our copy for years. Any tiny talent for sport I had was squashed on one primary school sports day when I picked the sack that had been sewn up across the middle - I couldn't get my legs in properly & fell flat on my face, presumably to provide comic relief for the parents! I did get into the Country Dancing Team though - much more my style. Oh, we really do feel for you regarding the sack race. How awful to be made a fool of in such a way. However, Country Dancing sounds a far better bet and we wonder if it extended to dancing around a Maypole too?!! Oh my golly, Jane and Lance. As one of the few Australians who hates sport - but who was obliged to play hockey in a haphazard, 'I'll do it if I have to' sort of way - I'm grateful you've presented sport as a historical activity, not as one that anyone sane would pick up as if it was normal. Go St Trinians, I reckon. Well, Faisal, this is another area of shared interest - sport as a historical activity!! We do tend to think of Australians as sporty outdoor types, but in your case clearly it is just the outdoors and not the sporty that holds an allure. Yes, come to think of it, the girls do have a St. Trinian's look about them......rather scary we secretly think!! Some people tend to jump into conclusion that organized game or mass game is the symbol of collectivism or even militarism. If people have terrible memory about that, I understand. However, we are a unique individual living in the community, we need to act either individually or in a group depending on the situation. We can learn sportsmanship in both genre but as I get older, I’ve come to dislike to belong to a group gradually, though I think I learned cooperation, tolerance to maintain harmony, or joy of sharing something toward one goal. It is nice to know that girls were encouraged to pursue their dreams in that college and the fruits of the education were handed down. Have a restful weekend, Jane and Lance. You are so right with what you say here about the possibility of any organised activity becoming confused with unacceptable, or militaristic, ideals. Happily this is seldom the case and we can, through team games, learn co-operation, respect for others and to live in harmony one with another. That said, we, like you, tend to avoid any group activity and do not, as a result, belong to any clubs or societies. Neither, as we said in the post, do we like sport but had we been fortunate enough to have had Sheila as a teacher, then we are sure we should now have an entirely different view of all games and, most likely, have become willing players. "Why stand when you can sit? Why sit up when you can lie down?" She exercised her mind by reading whenever she was horizontal (and awake). I don't mean to imply that she was lazy. She reared six children and could put a meal on the table in minutes whenever company popped in. She took daily walks well into her eighties (but not brisk ones!). My approach is similar to hers, and I seldom play games. At least not of the physical variety! Thank you for your visit and for the delightful comment you left! I live in the birthplace of rockabilly, so your references to the genre were particularly appreciated. I knew Carl Perkins (not well). His daughter is very sweet, as was her mother. It was very exciting for local residents when George Harrison attended Carl's funeral! Well, we can certainly identify with your grandmother too although we should be totally incapable of rustling up a meal in minutes, or days for that matter!! We loved the 1950s china and it brought to mind so many references of the period that we were laughing out loud at one point. What fun it would be to put the Tampico to good use and have a rockabilly party that the neighbours could talk about for decades. If only we were closer.......but we are sure that you are pleased that we are not!! As much as I revere and honor the past, I'm quite satisfied to have been dropped in this age-- one filled with most unprecedented magic and opportunity. How else might we have crossed paths!? Thank you so much for stopping by today and sharing your wisdom and insight. I also believe the best thing for children is to let them go. My parents died when I was 18. As difficult as that was at the time, in hindsight it was one of most valuable lessons in my life. I don't feel I would be who I am today without that. So difficult to express. I just know if they were alive today I would probably still be living there. Instead I explored the world without ties. This does not mean I wish what happened had happened. I hope you understand what I am so unsuccessfully trying to say. I'm happy to see a snippet of Kent because I traced my family name back to that place! I was one of those kids that shied away from sports to be able to read... being a portly child I'm sure had a lot to do with it. My idea of exercise is a jog with my St Bernard... and a turn on the pilates machine to keep me limber. I am in awe of those who do what your friend does. PS the only sports I watch regularly is the Kentucky Derby... NOTHING else. What a fascinating story about the women's college and your friend and neighbour. In those days, opportunities for girls and women to learn sports and physical education must have been very hard to come by so a school such as this must have been a quite a standout. I always enjoyed gym class when I was a child and excelled at many of the sports - gym education for girls was something I always took for granted. Many thanks for an excellent post! Perhaps inevitably we are to whatever extent products of the age in which we find ourselves. What for us is important that people have the opportunities to make the most of the talents that they possess. In this we count ourselves very fortunate indeed, but recognise that so many in so many parts of the world do not. We count the day that our paths crossed, dear Suze, as a magic moment! Oh how we laughed at this! Our grasp of Geography is so poor that we have had to look up the whereabouts of Tennessee, so finding our way there might well prove challenging. However, we are certain that, on arrival, it would be such fun.......one is never too old, in our book, to be a 'Mad Boy'!!! This made us sad. To lose both parents at such an early age must have certainly been life-changing but so very difficult to face the world's challenges without this support. We truly admire your spirit. And yes, we knew exactly [as much as can be exact in this virtual world]what you were saying. It has touched us deeply. How intriguing to have traced your family ancestry back to Kent. A relative once did this for our family and now we wish that we had taken rather more interest in the findings!! Yes, visiting a good coffee shop is more our style than running round a hockey pitch. But we do try to walk as much as possible to compensate for the scones, jam, butter.....!! Gosh, Diane, just reading the list of your sporting interests exhausted us. Clearly you and Sheila would be of one mind when it comes to physical activity. And, what a marvellous area in which you live to explore with your bicycle! Oh, the times that we wished to have our heads in a good book rather than up in the air watching out for stray hockey or cricket balls!! Now,the Kentucky Derby has a definite appeal. Indeed, signs of a dissolute youth are that we regularly visited racecourses throughout the UK with our grandparents and became quite good at reading 'form' and spotting winners!! Yes, you are right that immediately after the war there were few opportunities for women to train for professional careers and so this college did contribute immensely to the drive for women's emancipation. The ability for women to earn their own livings independent from their husbands was indeed highly progressive at the time. I love love love the photos -- they are so evocative of je ne sais crois! I am not a games person except for those that come around a table! Perhaps it has more to do with being so clumsy and uncoordinated. But I do confess to the occasional sideline glimpse. And I do like to swim -- but don't expect me to race with anybody! We are delighted that you like the photographs. The Bergman Osterberg archive which our friend Sheila has helped to develop is full of such wonderful images. Fortunately, they have all now been carefully catalogued and will be kept as a historical record for the future. So pleasing as they were under danger of being lost for ever. For us too, the board game is far more preferable to anything sporty taking place on a track or field!! How wonderful to hear from you. We do so hope that you have had a most enjoyable holiday. Ah yes, exercise.......it always SOUNDS like such a good idea!!! We no longer have a London flat, but if we did, then renting out for the Olympic season would have definitely been our choice too! !